I'd like to show that list to Rudy, my Golden Retriever. He could use some of those resolutions himself. Those resolutions are really cute Appeals. I have said my prayers for your baby. I hope all is well. I haven't seen Appeals here since New Years Eve......I sure hope that things are good. Maybe they are just too busy in everyday life to post. 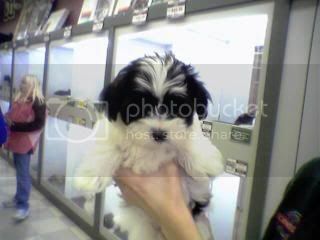 I fell in love today with this adorable little havanese puppy. The last thing I need is a 2nd dog, but she is so adorable! I know, I know! Can't sleep trying to decide and I know she will be snatched up by the week-end. It would be so much harder to walk 2 dogs, we shouldn't spend the money so soon after the holidays, but I WANT HER!! Oh Bobo2, please don't buy her if she is from a pet store!! PLEASE don't buy her even if she is absolutely adorable. Dogs in pet stores come from puppy mills. ALL dogs in pet stores come from puppy mills, regardless of what they tell you. NO reputable breeders will sell to a pet store. Even if you got your first one from a pet store, and I'm not in any way condeming you if you did, please don't do it again without some research on puppy mills. Even if you think you are rescueing this one, buying him/her perpetuates the suffering of many more - 100's of thousands more. Plus, this one most likely was taken from it's mom at only 4-wks of age, is poorly breed, may be hyped up on antibiotics to keep it alive for the trip from puppy mill, to distributor, to pet store, but will cost you much more than you would pay for a quality pup from a reputable breeder. You will not get what you paid for. Please goggle puppy mills. The state of Missouri is notorious for puppy mills and so is Lancaster County, PA. Yes, Lancaster County....the Amish. The Amish consider dogs livestock. They are treated horrifically. Not only are the living conditions horendous, they even do such things as ram steel rods down dogs throats to debark them. It's a standard practice. Cross my heart! PLEASE DON'T BUY ANY DOG FROM A PET STORE!!!!!! 1. If you were not at a pet store, please disregard, but still look do some research on puppymills. 2. I am not a tree-hugger - this is some very bad stuff - very very bad. Petco, etc., sold puppys and kittens in the past. They no longer do. There is a reason for that change. Yes, my first puppy came from a pet store. I took a lot of c**p from people about it. I also was criticized for shopping for a dog online. Apparently people were only going to be happy if I got a rescue dog. There was so much guff being thrown my way that I started to feel guilty. When her papers arrived the address of the breeder was given, in a small community about 60 miles away. It just so happens I pass throught this area twice a month in my business travels. So, the next time I was in the area I cruised by the address. I found a neatly manicured Amish farm at the address with a swingset and lots of clothes drying on the line. I wanted to stop, but wondered how I would be received. There was a garage sale going on next door so that provided an excuse to stop there. I told the neighbors about my dog and how I was "searching her roots." They summoned the breeder family, who were a delightful young family with bunches of kids. They were gracious and the kids were especially excited to see the pictures of the growing dog I always carry in my purse. It seemed the children spent lots of time with the puppies and I do believe that is why my dog loves children so much. Do I think the dog breeding was their main source of income? Absolutely not. I left there feeling good about my dog's beginnings. I feel she was loved from birth by her human family. Why do they sell the dogs through a pet store? I don't know, I didn't ask. I speculate they are private people who did not want people coming to their home, but I am not sure. Not sure they were thrilled about me intruding either, but like I said they were gracious. Before I located my dog I did contact a breeder who was referred to me as reputable. I wanted a specific breed and did not find a whole lot of breeders. When I inquired about a puppy via email, I received back a questionairre. The cover letter said if I was not willing to spend minimum $2500 not to bother to reply. For my minimum $2500 I would receive a show quality dog that I was NOT permitted to show, that I MUST neuter or spay or she would sue (I of course planned to do that anyway, but did not appreciate the threat of lawsuit). I could not pick the dog - she would assess my living situation and determine which of her dogs I could adopt. I won't even go into the questionairre, but I should have had to fill out such a thing when I had children. Not to adopt a dog. Now, I know there are good breeders out there (hi SunFreak). I just didn't find one for the breed I wanted that didn't have a waiting list for dogs that were not even conceived yet. And I do not feel my dog came from a puppy mill; you may disagree. But my dog is healthy, happy and has a sweet personality. She may not be show quality, but I do not give a hoot. She is a great pet. "they even do such things as ram steel rods down dogs throats to debark them. It's a standard practice. Cross my heart! " Never having had a puppy before I did not notice anything unusual about my dog. After having her a few weeks we went away for the week-end and left her with my SIL, who has lots of dog experience. When I returned she commented my dog was the sweetest puppy and loved the fact that she was so quiet and did not bark like other breeds. I was not aware most puppies barked due to my inexperience with dogs. At 10 months of age she is just now starting to bark. poor Bobo, the way to look at it is that you rescued her and she's yours and quite loved now. I know my daughter is like Memphis about the pet stores and puppy mills but it's an industry that I cannot understand isn't more regulated? I place the blame on governance first and foremost? I saw this tonight and we just laughed, how funny this was with all the snow the midwest is getting at least it would be a distraction to build a snowcat and not a snowman? thanks none, my daughter would love to make a snowcat. If only we would get some snow! We have had nothing more than a few frosted windshields in the morning. We are saving that link and hope to get to try it out. Very cute Jack Russell, Dolce!! Thanks Muffy. We visited my younger brother at his townhome for college and she just kept running and taking over his recliner and "posing". She is not spoiled or anything...HA! This is my other Jack Russell...his name is Leonardo (Leonard) ... we call him Leo for short. He is a HAM! This is my dog Grissom! He loves going to the dog park. I still think he looks like a snuffaluffacuss!! SO CUTE!! Does he shed much? Is his fur similar to that of a poodle? Do you have to shave him ever? I have a sister who wants a dog so bad, and my dad wants to get it for her, but she has allergies. She is 7 and she likes your avi. I just emailed them your photo of Grissom as a possible idea for her b-day. Is he a water dog? He is adorable. What exactly does that breed do, besides be a sweetheart?